Happy Holidays everyone! Have some obligatory mistletoe kiss. May your belly be full this holiday season. Aww such a cute little mistletoe kiss. 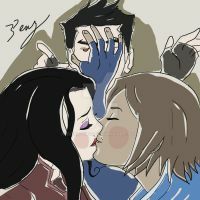 Asami: That's odd, I thought I had another sprig of mistletoe... oh well, as long as Naga didn't get to it I'm sure it'll turn up eventually. Korra: *Tucks stolen mistletoe into pocket for later* It's gonna be a great Christmas! Perfect way to celebrate with these lovely ladies enjoying each other. Such a cute kiss ❤ Beautiful!